The moulded RM bobbins showed here fit the annular space inside a pair of cores. The pins are arranged as "dual in line" or sometimes in groups as shown. Whatever the arrangement of pins in RM bobbin it is common for the inter pin distances to be arranged on a 2.54 mm (0.1") grid. The completed assembly is held together by spring steel clips of the shape indicated at below. 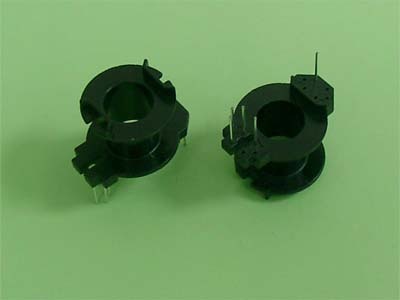 The clips have extensions that can be soldered into a circuit board at the same time as the bobbin pins lending mechanical strength and stability to the inductor or transformer concerned. RM bobbins have little room for meeting safety spacing requirements. Large center leg. Terminating multi-filar windings to RM bobbin pins is difficult. 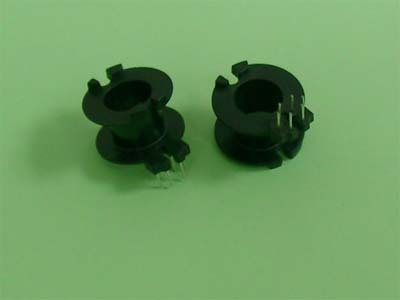 RM bobbin has many through-hole options in thermoset and thermoplastic. No surface mount versions are available. RM Bobbin cost: relatively low cost. 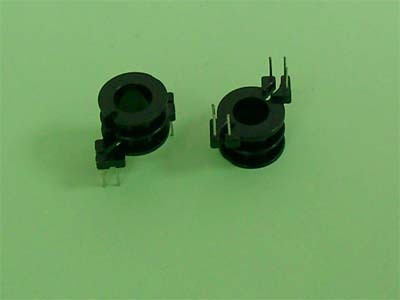 RM bobbin is an ideal starting point for the design and construction of small inductors and transformers.